A Family Ski Vacation is the best way to introduce your kids to a lifelong sport. By taking the family skiing for a week, whether traveling out west or the Alps or even a New England ski resort, everyone gets to participate in skiing and snowboarding for several days, improving their skills and enjoying the snowy mountain environment. When they’re very young, starting kids on skis gives them a lifetime advantage. The best age to start is typically between 3 and 5 years old, depending upon their physical strength and coordination, and their eagerness to be outside in winter. Some kids mature more quickly than others. But being out of diapers is essential before you start your kids on skis or snowboard for obvious reasons. Read our tips on teaching your kids to ski, finding the best ski camps for learning to ski and ride. A good ski school or snow sports program can make all the difference in your child’s first ski or snowboard lesson, and therefore can make or break your family ski vacation. If the kids are happy, then mom and dad are happy and can enjoy some ski runs to themselves. You can certainly teach your kids to ski on your own, but you need to be patient, make sure they are outfitted properly, and not put too much pressure on the child or their performance. A ski week in a condo or on mountain hotel provides easy access to the slopes, ski camp, nursery or childcare and you can often walk to ski area restaurants and après ski activities. An outdoor heated pool or hot tub are a bonus on ski vacation – though some find them essential for soaking those soar ski muscles at day’s. Look for ski resorts with family activities beyond the basic 9-4 lift operations. Bonfires with mascots, family movie night, tubing parties, and pizza parties for the kids all add to your family ski week experience. During holiday weeks, you pay more, but school vacation weeks often require high school age students and parents to travel during these peak (read: pricey) time periods. The good news, there are usually extra events, fireworks and even extended lift operations during school vacation weeks at ski resorts. Resorts like Smugglers Notch and Okemo in Vermont, Waterville Valley NH, Sunday River and Sugarloaf in Maine do a great job entertaining skiing families in New England. Tremblant in Quebec is family oriented. In The Rockies, some of the best family ski resorts are Steamboat, Copper, Vail, Beaver Creek, Snowmass at Aspen, Northstar, Big Sky Montana, and Deer Valley. 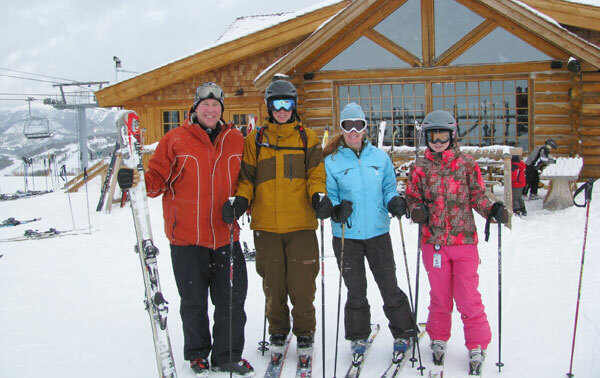 We have reviewed these skis resort so see our firsthand family ski resort reviews for details on each ski resort. Look for all inclusive ski and stay packages when booking your family ski week. 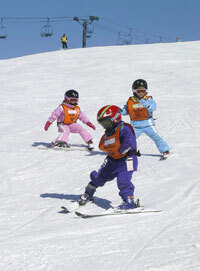 Ski resorts often include ski camps for the kids, or free nursery, particularly during non holiday weeks in January or December. If you can ski midweek, you will have less crowds, more attention for your kids in ski camp and usually a less expensive ski vacation. It’s nice to stay in a full service hotel, but the additional cost of family meals for breakfast lunch and dinner can add up. Often, a slopeside condo with a kitchen provides the option to cook in some premade meals to save money and adhere to everyone’s taste – kids can be finicky when dining out in new places. Do your research, ask your friends where they like to take their family skiing, call the ski resort or go to the resort website then check the raves and reviews. But definitely take your family skiing. It’s one of the few sports that you can enjoy with multiple generations. The family that skis together stays together.